I was looking for a complete set of bedroom furniture for my new home. Shopping around the “main” furniture shops I found out for the look and choice I desired, it was probably going to be well over my budget! That was all about to change…!!! One day I was working near the Castledawson area and noticed some advertising for “Bedrooms & Beds” thinking I had nothing to lose I dropped by. I walked around and the first thing I couldn’t believe was how reasonably priced everything was let alone the pieces I saw and wanted already! 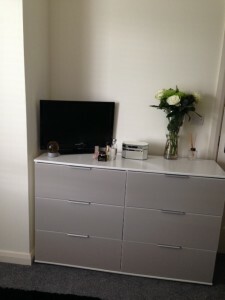 I was met by Michael who was extremely likeable and helpful, not pushy and within that visit I had chosen my bedroom furniture and bunk beds for my children for a price I couldn’t believe!!! Further to this a few weeks later my furniture was delivered and all erected for me. To say I am pleased is the understatement and this was all complemented by my choice of bedding and accessories! Unfortunately many people are unaware of smaller furniture establishments and out of convenience opt for the larger, overly priced shops. Suppose it’s all about being “in the know” ~ hence why I wanted to take the time to write this and share this little gem of a place !! We bought a sliding wardrobe from Bedrooms & Beds back in January of this year. We needed something that wouldn’t take up much room, was modern, but most importantly would house clothes, shoes and coats, so that the room never looked cluttered. The wardrobe was installed very quickly after we had chosen the style we wanted, in fact, you would not have known anyone was in the house. The room was left as we had left it that morning. The wardrobe has huge capacity and with an additional built-in shelving unit, made it very easy to store other pieces of smaller clothing, make-up, scarves etc. 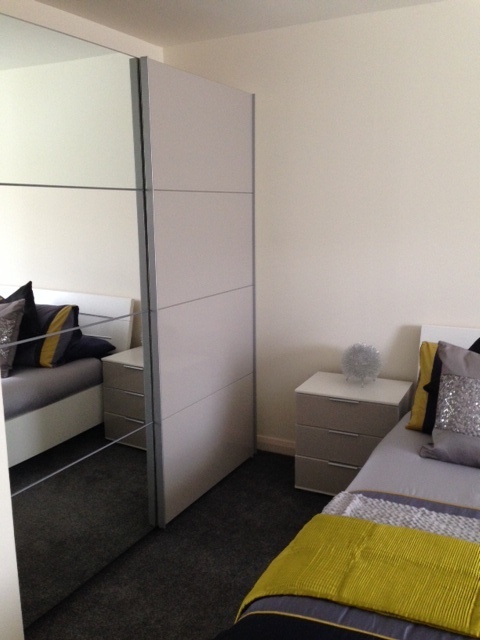 Furthermore, the wardrobe was sleek, modern and with glass panelling reflects so much more light into the bedroom, making the room feel more spacious and calm and tidy. A huge thanks to Michael for his advice, providing the additional unit, organising the delivery and assembly and in general providing a great unit for a very reasonable price, bought locally. Thanks again Michael and look forward to doing business again with you in the future.